Johns Hopkins researchers have discovered a new mechanism that explains how cancer cells spread through extremely narrow three-dimensional spaces in the body by using a propulsion system based on water and charged particles. The finding, reported in the April 24 issue of the journal Cell, uncovers a novel way that the deadly cells use to migrate through a cancer patient’s body. The discovery may lead to new treatments that help keep the disease in check. The work also points to the growing importance of studying how cells behave in three dimensions, not just atop flat two-dimensional lab dishes. Based on such lab dish studies, cancer researchers had concluded that tumor cells require actin and other proteins to form arm-like extensions to “crawl” across the flat surfaces. This type of travel was believed to be the primary means of how cancer spreads within a patient, a process called metastasis. Based on this conclusion, researchers have been working on ways to disable actin and its molecular helpers, hoping this can keep cancer from spreading. This illustration depicts how a cell can use a water-based “engine” to migrate through confined spaces in the body. Graphic by Martin Rietveld. Kostantopoulos said Sun and Hongyuan Jiang, a postdoctoral fellow working in Sun’s lab, “came up with a phenomenal mathematical model that provided insights into how the cells might use a different system to travel.” Then Konstantopoulos and other team members, including Kimberly Stroka, a postdoctoral fellow in his own lab, used a microfluidic lab-on-a-chip and imaging techniques to conduct experiments establishing the new mechanism of migration proposed by Sun and Jiang’s model. The tests utilized human and animal cancer cells. Stroka and Jiang were designated co-lead authors of the resulting journal article. As reported in the article, the tumor cells’ new “engine” turned out to be a combination of sodium-hydrogen ions, cell membrane proteins called aquaporins, and water. The researchers found that within tight spaces, cancer cells create a flow of liquid that takes in water and ions at a cell’s leading edge and pumps them out the trailing edge, propelling the cell forward. In the actin-dependent migration model, the cell is pushed forward by the biochemical equivalent of a boat engine. The water-based mechanism, the researchers said, more closely resembles the way a sailboat is thrust ahead by gusts of wind. The team called this mechanism the Osmotic Engine Model. The Johns Hopkins researchers are applying for funds to conduct further research into physical and biological aspects of the Osmotic Engine Model. Their hope is that the work will uncover a way to shut down this biochemical engine and keep it from spreading tumor cells. The multidisciplinary research at Johns Hopkins was conducted within the university’s Institute for NanoBioTechnology and its Physical Sciences-Oncology Center. These organizations and the departments of Chemical and Biomolecular Engineering and Mechanical Engineering are based in the Whiting School of Engineering. Co-lead author of the Cell article Stroka will join the faculty of the University of Maryland College Park as an assistant professor later this year. Whiting School postdoctoral fellow Jiang, the other lead author, also is now a professor at the University of Science and Technology of China. Kostantopoulos and Sun supervised the research and served as senior authors of the paper. Other co-authors, all from Johns Hopkins, were Shih-Hsun Chen, Ziqiu Tong and Denis Wirtz. This work was supported by National Science Foundation grant NSF-1159823, National Cancer Institute grants U54-CA143868, RO1GM075305, RO1CA174388, T32-CA130840 and F32-CA177756, a Kleberg Foundation grant and National Natural Science Foundation of China grant NSFC 11342010. 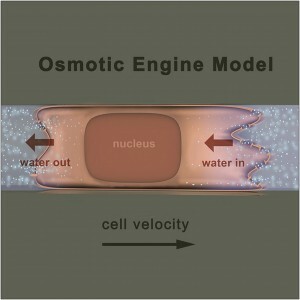 An illustration depicting the Osmotic Engine Model is available; contact Phil Sneiderman.